Services like Foursquare, Gowalla, and Facebook are growing to involve more real time video chatting. Expect to see location-based messaging being used for ‘online’ places, like virtual reality communities. ChatSq, built on the Foursquare API, has picked up on this potential of leaving messages for friends to get when they get to a location, experimenting with connecting Foursquare users by creating chat rooms that are tied to venues. Enabling each venue to have it’s own mobile social network. Loopt expanded its ping feature to “location-based text message” making use of push notifications to allow users to communicate and subsequently share their location through the Loopt service. Loopt allows a user to “group message” any number a friends checked into the same location. When running late to meet friends for dinner you can update the whole group waiting at the restaurant (provided they’re friends on Loopt) with your current location. Check out this post by David Kerpen. 9 Lessons From Successful Brands on Twitter Cisco is one of them! Target doesn’t have an identified team of people, you interact with the brand. All their tweets come from “Target Tweets.” They do take ownership of mistakes and distribute comments to the different departments, they provide customer service information and if someone complains that an item is sold out they try to find it for them. Last holiday season they asked people to share their #TweetTidings and rewarded them with a $10 gift code. Sometimes they would just pick up tweets and reward them with $10 gift code! It all started in March 2007 when an MSN Money article called “Is Home Depot Shafting Shoppers” by Scott Burns got a lot of feedback. The response on the discussion boards was overwhelming – 7,000 comments within 3 weeks all echoing the same sentiment. The Home Depot CEO posted commentary asking customer’s to give them time to improve customer service and their help in making it a better place to work. This was the first foray in to social media and it opened everyone’s eyes to see how engaged and passionate people were about their brand. Fast-forward four years, The Home Depot has come up with an interesting model for enabling their employees to assist customers through social media. They aren’t the first to get employees answering customers questions through social media channels, Best Buy has a community team, that answers questions, rates answers online and utilizes Twitter in multiple languages called the Twelpforce. According to AdAge, The Home Depot’s model is a bit different, they developed a hybrid model of social-media store associates. When the social media team approached the CEO with a request to start a social media team, Mr. Blake pushed back, saying that Home Depot’s store associates were the company’s strongest source of knowledge, and he wanted to think about how to use them before adding people to the corporate communications team. The Realtime Report has a decent summary of the model. 3) Engage associates in a way they haven’t done before. The 300,000 employees have tribal improvement knowledge that they want to leverage. The Digital Orange Apron is an extension of an iconographic part of the brand. Speaking at the latest Cornell Hospitality Research Summit (CHRS) in the United States, Hilton’s senior VP of corporate strategy Kevin Jacobs said in his presentation the hotel group had “gone all in” with its social media strategy, which included a focus on mobile applications. “Since over 80 per cent of Hilton’s guests travel with a mobile device and 40 per cent use it to search travel, mobile apps make sense,” he said. 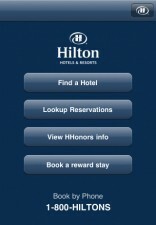 Hilton’s mobile apps have seen more than 340,000 downloads, he added, and guests used them to book well over 100,000 room-nights in 2010, with revenue up 200 per cent. CHRS last month published its summit proceedings, which include key points from presentations made by Jacobs and other hospitality industry experts at the summit held in October 2010. Consumer’s are rapidly adopting social technologies – in other words – they are engaging more and more through collaborative tools. Building and growing online communities, which consist of people who want to share their knowledge, perspectives and solutions, is considered critical in a marketplace where product differentiation has lost its competitive edge. Communities provide a way for consumer’s to engage with the brand. Video is evolving on the web and has become a powerful tool for driving conversion whether it’s a product demo or a how to video. It has become an impactful tool when imbedded in a community context that has traditionally included text-based discussion boards and blogs. The Home Depot – The Home Depot Social Media team is building a garden for filming “how to” videos to post at community.homedepot.com. Read more here. Kenmore Studios – Kenmore has built a studio from which they can stream live events on Facebook. Their product demonstrations are embedded in entertainment. According to a Forrester research Case Study on Backcountry the company has seen increased conversion rates after adding video and photos. Those who click on user-generated photos are three times as likely to convert. Participation is high, 84.9% of those with a user profile have at least one community contribution and the average value of an order by a community member is $25 higher than a non-community member. Check-in = Loyalty? Traffic? Sales? Interesting article analyzing 4Square Check-In behavior between direct competitors Lowes and The Home Depot by PlacePoint. The author is suggesting that while The Home Depot has more total check-ins, Lowe’s holds the slight advantage in terms of customer loyalty. Lowe’s customers check-in more often than Home Depot customers. Based on these check-in statistics, Home Depot holds a significant edge over Lowe’s. Its total volume of check-ins and total number of people that have checked-in is nearly twice that of Lowe’s. A Generation Fluent in Engagement? James Franco walked on stage at the Oscar’s with his mobile phone and tweeted throughout the event. Most agree that he did a terrible job as host- seems to be more comfortable engaging through his phone. We launched Nanette Lepore’s interactive mirror at the National Retail Federation Show in 2007. I’ve been keeping track of “virtual” apparel shopping experiences ever since. I wouldn’t say that any deliver a great experience but they provide a vision of the future. They fall in to a few categories: trying out new clothes without having to go to the store, trying them on virtually while in the store. I have also been following the trend of social retailing which is where you can bring others in to the shopping expereince. In the spring of 2008 – Microsoft Research team created a version of the mirror where girls can dress up as princess in front of a “magic mirror” for Disney Innovations Dream Home. It is rumored that this concept will appear in Disney’s new retail stores. In the Fall 2009 Cisco showed our idea of a future shopping experience. In an attempt to overcome one of the biggest obstacles of online shopping – the inability to try a garment on before purchasing – these online applications allow you to “try on” clothes you see online. JCPenny Virtual Dressing Room on the Seventeen Magazine Site uses fits.me technology ( start-up that just secured $1.5Min funding) to enable teens to try on clothes virtually at home. Set up is easy. Just allow access to your web cam, position yourself to the figure on the screen and then use motion to select items to try on. It might work well if you have a large display but accessing from my laptop was a bit awkward and the images were small and it was hard to imagine how they might look on me. Tobi Virtual Dressing Room is very similar to the JCPenney app with one exception. It requires an extra step which I think makes it a barrier to using it. The shopper needs to print out a symbol (marker recognition) and hold it up to set their position. The technology is by Zugara. The in store examples include enabling customers see combinations of items (even ones that are not in stock), see what something looks like from all sides and to connect with friends to get their opinion while shopping. The third element is might be the most interesting from a conversion standpoint, since for most shoppers an opinion from a friend is usually the deciding factor. Meta Technology has built a solution that has a lot of the same elements the Nanette solution. See the video here video. They have also put together an interesting overview of the benefits. Diesel Ginza Store (Japan) has an interactive Mirror which plays the role as a communication tool between the sales staffs and the customer. It is designed with an intuitive touch screen interface. It has functions like capturing high-resolution photos of the customer as they try on clothes from any angles even back shot. Customer can compare those shown items individually and see which item is the best. There are also various real-time effects that entertain customers. When not in use it plays advertising movies and runway videos. It displays maximum 6 of recorded photos on the screen at once. Developed by Non-Grid. Go Try It On uses photos to enables you to get your friends opinion on how you look before you go out for the evening. You can upload a photo of yourself and a description of the brands you are wearing. The site’s community then posts comments on what they think. The iPhone app allows you to upload your image as well as access the feedback. Go Try It On faces competition from Weardrobe, Polyvore, and Fashism (which also just launched an iPhone app). Google’s ecommerce fashion site features curated boutiques by tastemakers and bloggers. The goal of the site is how to engineer the shopping experience for taste. We buy a camera based on the specs but how we decided what to wear requires assistance and is driven by the occasion and our personal style. Google’s site helps you to understand what the tastemakers feel will be hot as well as what might be right for you. You can follow celebrity stylists and create your own personalized boutique — others can follow you. This idea is based on a Street Style culture – that girls walking down the street can be stylish. It has an excellent mix of curation (by experts and enthusiasts), social shopping and personal recommendations. I set up my profile and was impressed with visual nature of the experience which enabled me to select the cut, colors and styles I prefer. I thought the recommendations were very in line with my style and taste. I am loving the emails I receive on sales items from my favorite designers. See this report for more information. IKEA allows people to try furniture in the context of their own home through an iPhone app. IKEA also uses this feature try out new designs and get feedback on likes and dislikes. Amazon Opens Pampers Store on Facebook. The Pampers Webstore on Facebook is owned and operated by Amazon.com. It means consumers don’t need to leave Facebook to buy Pampers products. Consumers use their existing Amazon account during checkout to order the products, although they are still on the Pampers page. – Selling through Facebook drives people to “like” the brand and increases the value of the earned media advertisers get from dollars spent. – Getting a Facebook member to “like” or “fan” the page allows the brand to send the consumer messages. One of the easiest ways is through Facebook paid advertising. Ebay has launched a solution that makes it easy to contribute (and therefore collect) the money toward a purchase of a group gift. This online group gift-buying service is call GroupGifts. Consumers go to groupgifts.eBay.com, choose a gift and invite friends and family via Facebook or email. If you don’t get enough contributions you can either request more money or choose a less expensive gift. Here is a video of the service and a USA Today article with more information. My mirror was recently installed for Fashion Week at Macy’s. Here is a CNN article. Try on clothes in the store and send images via text, email or post to Facebook. (Sadly, they didn’t have streaming video in this version). This installation is based on the mirror we developed for Nanette Lepore.